This recipe was a recipe from my old blog but I thought in spirit of pie day (3.14). I would post my most extravagant pie recipe from Matty Matheson. So enjoy this lemony goodness. I showed my brother this video 3 months before his birthday ( which falls in November) and just as he discovered his love for lemon meringue. So naturally he asked me to make him this monster. If you are offended by swearing I cannot be held accountable, however I can be accountable for how delicious this pie is. Matty Matheson is a chef from Toronto and has a couple of restaurants under his belt. He’s pretty unconventional when it comes to cooking tutorials but that’s why he’s awesome. 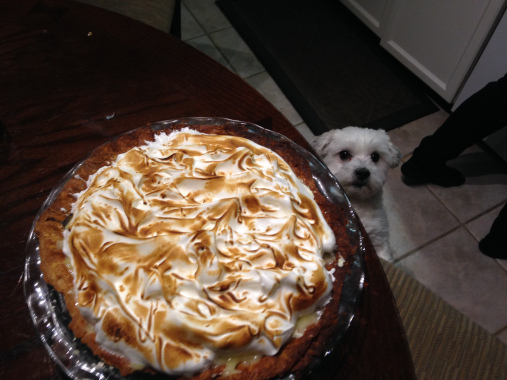 There was no written recipe for this pie, so it was basically just a matter of pausing the video every twenty seconds and now I can share it with the world/ the 6 people that read this blog. Okay first things first the crust ( you know how I feel about crust) it’s crucial to your existence blah blah blah. Okay so you can make the crust Matty uses in the video but I just used a crust that I had a in the freezer from thanksgiving so naturally it was my Vodka Crust which literally never fails. If you wanna keep it casual just buy a crust, but seriously if you’re gonna make this just go all in. Just remember since you’re cooking the pie crust alone line with foil and add some pie weights ( aka dried lentils or beans) so it doesn’t puff up and cook for 15-18 minutes. You could make the dough a couple days in advance or freeze if it’s going to be longer. Cook the crust, and allow it to cool to room temp. While it’s cooling you can make the cream cheese filling. First thing you’re going to do is whip heavy cream until it forms peaks. Make sure you do this first since whipping cream will NOT form if you added it after the other ingredients.Remove the whipped cream from the bowl into a smaller bowl. Then using the same bowl add the mascarpone cheese, as well as the cream cheese and a quarter cup of sugar. Whip until it forms stiff peaks. Then add half of the whipped cream and FOLD it in gently. Leave it at room temp. Next up we are making the lemon filling. So you’re going to add gelatin sheets to water and wait for it to get nice and “goopy” as Mattty says. I didn’t have gelatin sheets so I just used gelatin powder. Follow the instructions on the packet. Both work fine. In a bowl add six eggs and whisk in a cup and half of sugar. Juice enough lemons to make 2 cups of lemons juice ( about 12 lemons). Cook eggs and sugar over a double boiler (aka a metal bowl over a pot with a couple inches of simmering water under it) Essentially stand over and whisk until it thickens. Add your gelatin and then slowly add your lemon juice to it until it can easily coat your spoon. Then add the cheesecake filling to the pie crust, and put in the fridge for 10 minutes. Next and final layer step the meringue. You’re going to take the egg whites and add a teaspoon of white vinegar. Start whipping it and eventually and slowly add in the sugar. Until there are stiff peaks. Then you can add the lemon filling to the pie and set in the fridge for 10/15 minutes. After the filling has set, add the meringue gently and form peaks. Like tiny little meringue mountains. Then the really fun part. Using a kitchen torch toast the meringue. If you don’t have a torch just use the broiler in your oven but keep an eye on it. This look just says it all, doesn’t it???? Make Vodka Pie Crust . Since you will just be cooking it without filling in it. After you prepare the crust in the pie plate line it with tin foil and use some dried lentil or beans as pie weights. Bake at 450 degrees for 10-15 minutes. Let cool to room temp. Then make gelatin mixture using either sheets or powder, follow the directions on the pack. Juice lemons, or just pour two cups of lemon juice into a bowl. In a separate bowl add eggs and sugar and beat together. Put on a double boiler. You can use a metal bowl over some simmering water, it’s all the same. Whisk constantly until it starts to thicken, don’t stop stirring or you will have scrambled eggs. Add gelatin and mix until combined. Slowly add lemon juice until it coats the back of a spoon. Let sit in the fridge. Then you can add your cream cheese layer to your pie and let sit in the fridge for 10 minutes. To make the meringue add egg whites and white vinegar and start to beat. Slowly add the sugar spoonfuls at a time. Until it forms stiff peaks. Take the pie out of the fridge and add lemon layer and let sit in the fridge for 15 minutes. Softly add the meringue to the top and create peaks with a spoon. 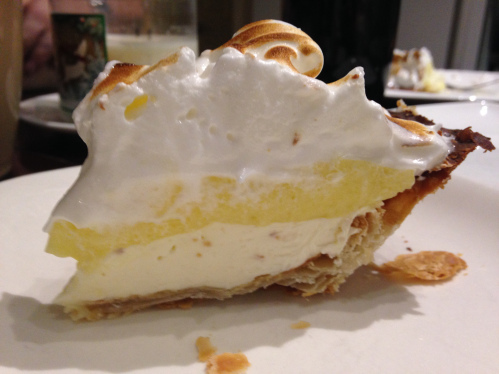 Use a torch to cook meringue or watch carefully in the oven on broiler.